When I was a kid one of the best things about Christmas was the candy. You see my Mimmie didn’t really let me have any candy and my parents did but they bought the candy they liked in bulk and, as it happened, it was candy I didn’t like. Anybody remember Tart ‘n Tinies? Blech. But at Christmas-time everybody went candy mad. My Mimmie would buy a gigantic box of chocolates and the only rule was that if you took a bite you ate it whether it was one you liked or not on pain of never getting another chocolate again. This very strict policy is why I began poking a hole in the bottom of every candy them with my finger until I found one I DID like! There were also lots of tins of butter cookies and candy canes doubling as decor and snacks. My mom would buy big plastic buckets of gum drops and peppermint puffs that would melt the second they hit your tongue. And lots and lots of chocolate. Yep, it was all about the candy for me. 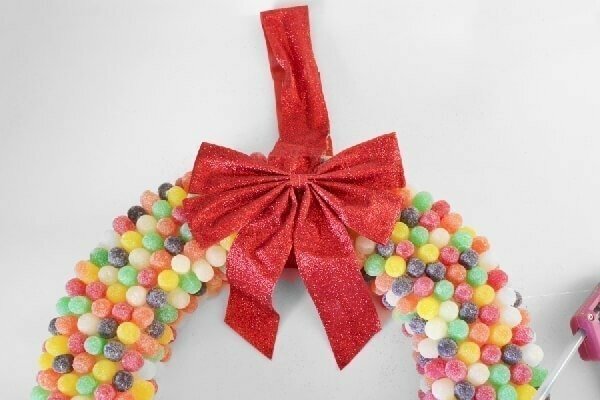 So when I was thinking up Christmas crafts for this year I kept going back to candy. Some of the projects are working out well but others aren’t exactly panning out. I mean, candy isn’t typical craft medium for a reason. 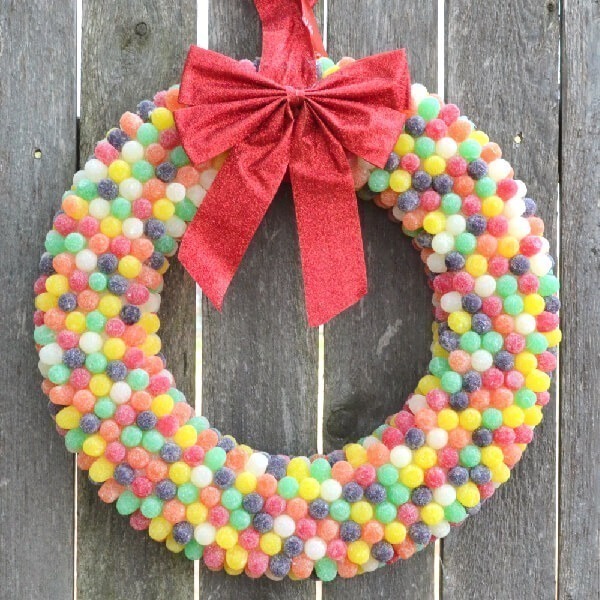 But I am so pleased to announce that this gum drop wreath turned out so amazingly well, if not a little bit heavy. And to be honest, these are actually spice drops as I couldn’t find gum drops for sale quite yet but either ones will work for this project. First start a straight line of the drops going across the wreath. 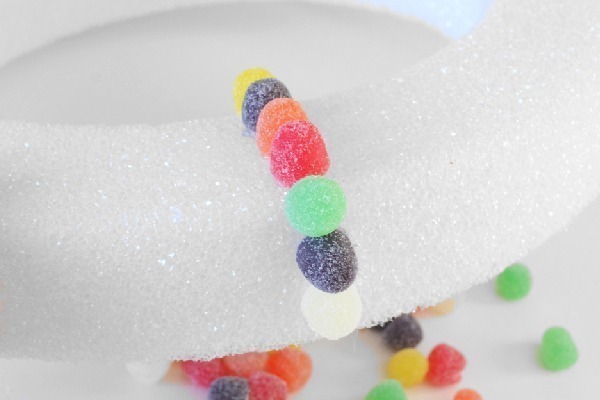 Use a healthy daub of hot glue to ensure that each candy stays securely in place. Stagger the gum drops as you glue them, nestling the next in the curve made by two side by side. Continue gluing down the drops going as close to the edges as you can on the outer and inner edges. Now this is where I ran out of candy. I purchased 4 ten ounce bags thinking that would be overkill. Ha! Think again! I may have mentioned that this sucker has 5 pounds of candy on it. To hang so that it is nice and sturdy I took apart one of my glitter bows (there were 3 to the package) hoping that it would be one big piece of plastic/fabric. It wasn’t so I had to staple and hot glue it into one continuous strip around the wreath. I covered my ugly staples with the bow and shoved some more hot glue where I could just to be extra careful! Don’t place this outside where it might get rained on because this is candy after all making it a strictly indoors bit of decor. 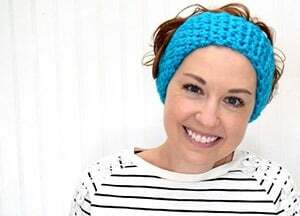 Will you be hot gluing candy any time soon? 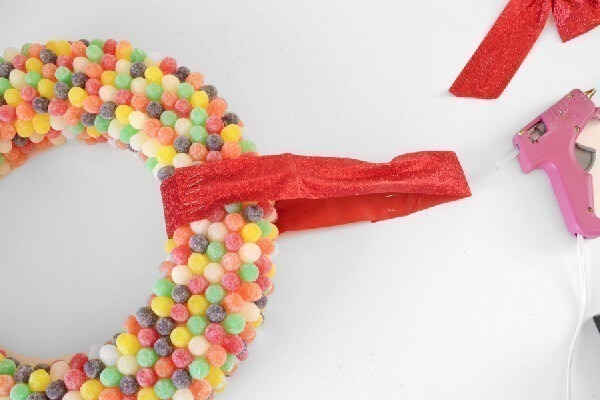 This is so super cute, though if I tried making it I would probably end up eating all of the gum drops lol. Now if I had gum drops and not spice drops there would have been some serious chowing going down so I totally feel you :) Luckily I HATE spice drops!!! Hello deliciousness! I love the colors. I bet this wreath is quite heavy, huh? Looks great! 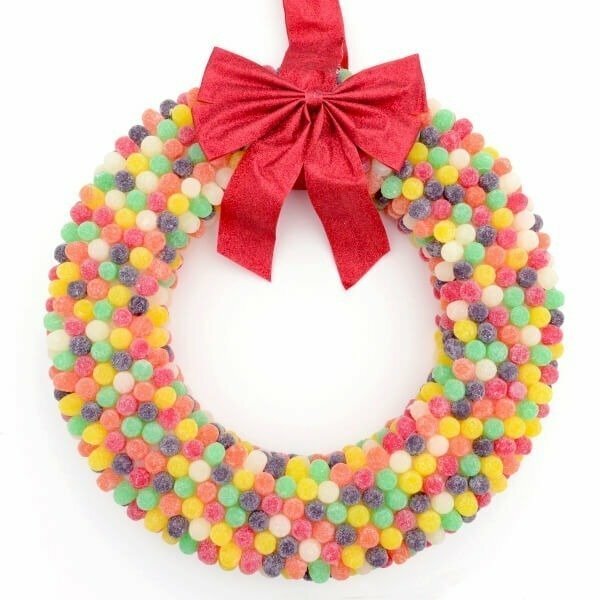 Oh, this is a super sweet wreath! I love how it’s so colorful. I had a hard time waiting until the ants seemed to disappear around here to work on this. I live in the country and if it’s warm out and I walk away from food on my desk, I might just come back to a bunch of ants on it! I totally feel you and that stinks! I made topiaries one year out of the styrofoam cones. But I used toothpicks instead of hot glue. It took for freaking ever but looked cool. Wish I had thought if the hot glue. I bet that sped the process up a lot. Looks lovely! Oh, goodness I can only imagine how long toothpicks would take! Hot glue is always my go to, it would seem! I bet those topiaries were gorgeous. You should TOTALLY recreate them! Quick question, how did they hold up through storage? Did you toss them because they were food or did you try to hang on to t hem for the next year? Did you put a chellac on this after you were done? It’s beautiful! Just might do this. I didn’t because I was worried it would ruin the sugared appearance, but I also decided to throw it away because I was worried about bugs so maybe I should have tried! I’ve made these before as well as the peppermint candy wreaths. They are adorable. My issue is always ants. I spray the peppermint with shellac but it never seems to really set the candy. Maybe some sort of resin coating would work?? I think resin could work really well. I worried about ants but it got so cold where I was I guess they were in hibernation or something! 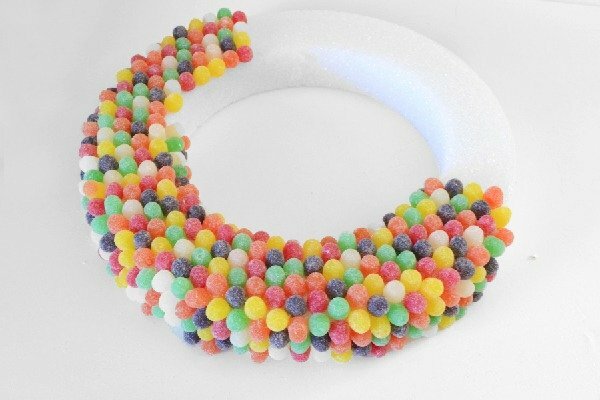 I’ve put candy in resin jewelry before and that business stayed perfect. Let me know if you give it a go. I’d love to see your results!